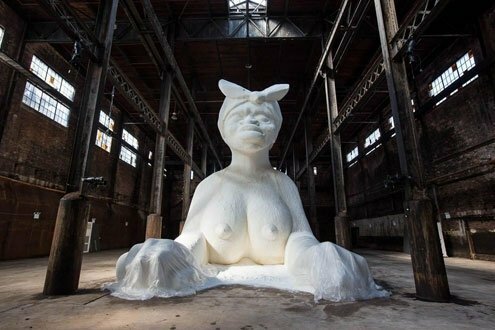 Kara Walker's candy sphinx in Brooklyn: a new world of wonders. hen you move back to the United States after more than four years in Italy, you wonder if you’ll slip back into certain patterns. Some are large, like the instinct to define a good life as a successful life, and a successful life as one tied to a specific salary and C.V. — an equation that starts off so broadly, and ends up so limiting, you’re not sure why you never questioned the math before. Others patterns are more minor. The way you always used to buy canned pasta sauce. Or how you thought nothing of wearing sweatshirts or yoga pants outside the house, or going out with wet hair, or eating lunch at your desk. How you didn’t always say hello to a shopkeeper when you walked into the store, or say goodbye when you left. But these adjustments cut deep. Six months into New York life you still call the subway the “metro.” When friends share gut-wrenching anxiety about career or social expectations, you try to help relieve, not add to, the burden of what they think they should be doing. Faced with Kroger grocery aisle the length of the Coliseum ticket line with only sodas you nearly have an anxiety attack. You make your own pasta sauce. One day, eating outside with a colleague, he remarks how nice it is. He tells you he hasn’t had lunch outside the building in months. You’re startled, and not just because the comment sounds absurd. You realize that you too have eaten lunch at your desk for the past few weeks. Crumbs on the keyboard: a sure sign you’re readapting to American life. You also realize you’re beginning to absorb if not feed off New York’s frenetic energy. You’ve tried not to. You chose an apartment on a tree-lined avenue in an un-hip part of Brooklyn rather than downtown Manhattan, more to preserve serenity than cash. You try to devote time to cooking, yoga, and walks. But as often as not, the fresh herbs you bought wilt in the fridge, your yoga mat languishes in your closet, and the walks are staccato sprints to work or dinner. In Rome, you’d make a last-minute call to friends to arrange a drink. Plans were often sketchy. 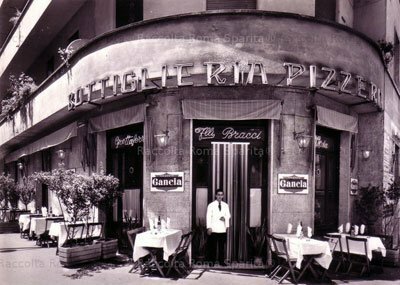 You’d meet in the piazzetta and see where the evening took take you — sitting on fountain steps with a shared bottle of wine or dinner at a favorite trattoria, or maybe just a best friend’s apartment and terrazza. Now, when friends ask about drinks next Friday, you apologize; you’re booked, and next week you’re out of town, but what about the Friday after the Friday after this Friday? You felt a little embarrassed until you realized they all do the same thing. A few times, you even leave the house in a sweatshirt and wet hair. But returning also brings back long-lost rhythms. You’d forgotten what it was like to discuss American politics with people who knew them intimately. You’d gotten used to leaving your funkier outfits in the back of your closet, knowing they’d attract strange looks in conservatively stylish Rome. Time differences meant you hadn’t been able to just pick up the phone and called a loved one anytime, anywhere — or, better still, hop on a train or plane to see them. And you’d never lived in a city that offers such variety: a performance of “As You Like It” in Central Park’s amphitheatre; a 75-foot Sphinx made entirely of sugar in Brooklyn’s soon-to-be-demolished Domino factory; cocktails on a hotel rooftop overlooking New York’s skyline; a bizarre-looking twine of garlic scape purchased at a farmers’ market — all of this in the course of 24 hours. You realize your new home is having an effect on you. Some of it you’re not sure you like, some you know you do. And you come to realize that it doesn’t matter whether you’re in Rome, New York, or Timbuktu. The idea is trying to get the best of each. That isn’t just a good lesson for moving to a new place, but also for moving through life. Now, you just have to get those crumbs off your keyboard. Amanda Ruggeri's column "La Straniera" ran from 2010 through mid-2014.